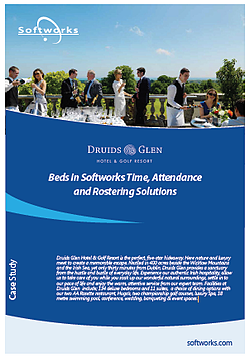 Druids Glen is a luxury five-star Hotel & Golf Resort. Facilities include; 134 deluxe bedrooms and 11 suites, two restaurants, two championship golf courses, luxury Spa, 18 metre swimming pool, conference, wedding, banqueting and event spaces. In this case study we share their story about how they are using technology to manage their employee's Time, Attendance and Rostering. How they implemented the new technology. How they currently use the system across their resort. The benefits it brings to their day to day business and operations.